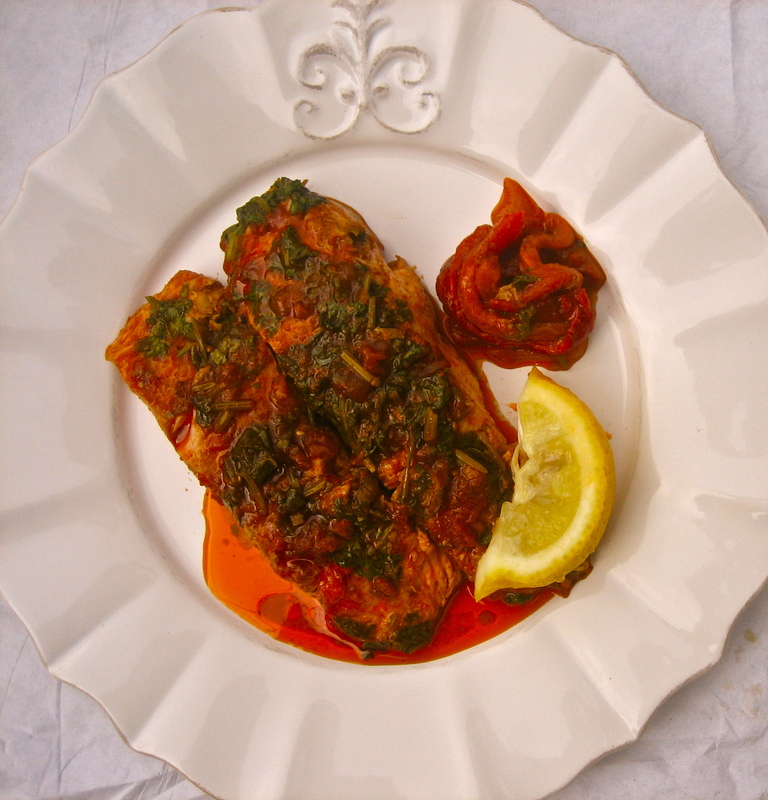 On Friday afternoons you’ll find my mother-in-law in the kitchen, preparing dozens of salads, meats, side dishes, and this classic Moroccan-style fish. Her kitchen is a flurry of activity- the stove top covered with pots, the counters lined with mixing bowls, and vegetables waiting to be peeled awaiting in bowls on the kitchen table. My mother-in-law moves seamlessly through her kitchen- making all of these dishes simultaneously, stirring the fiery-red matbucha with one hand, turning peppers over an open flame with another. Adding a squeeze of lemon here, a drizzle of olive oil there. By the time everyone gathers around for dinner, the table is covered in a full array of little dishes from vinegary grilled peppers, potato salad, cooked beets and cumin-spiked carrots, to pickled vegetables, babaganoush, and crisp fried eggplant coins with the most meltingly soft interiors. The list goes on. We pass the salads, our plates a rainbow of color, and the fish makes it’s dramatic entrance, shimmering in it’s velvety red gown. We’ll dig in, sopping up the sauce with challah as we discuss the week’s events. By the time the main course arrives- meats, chicken, rice, potatoes- we’ll protest that we can’t eat another bite. We’ve asked for the recipe many, many times. But making Chreime is so second nature and intuitional to my mother-in-law, that she’ll omit the lemon juice when she speaks to Yaki, and the garlic when she speaks to me. It’s taken me years of trial and error (and snooping) to get the recipe just right. Now, it’s on regular rotation in our home. As the fish simmers gently, I think of how many other houses have a similar dish on the stove, and I feel connected to a long tradition of cooking, recipes handed down from one generation to the next, entire neighborhoods serving the same dish. 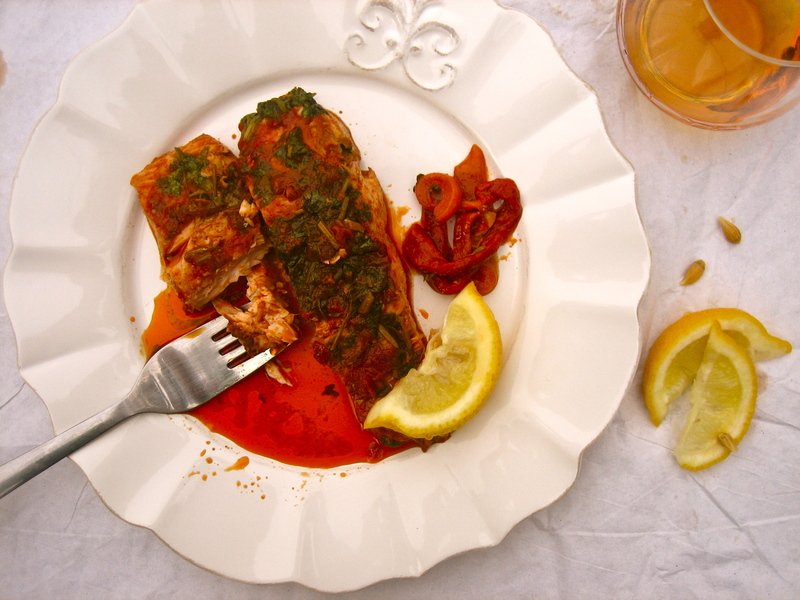 A staple in many Moroccan households, Chreime features fish gently simmered in a festive red sauce. My mother-in-law varies the fish she uses, using anything from salmon to tuna or white fish. 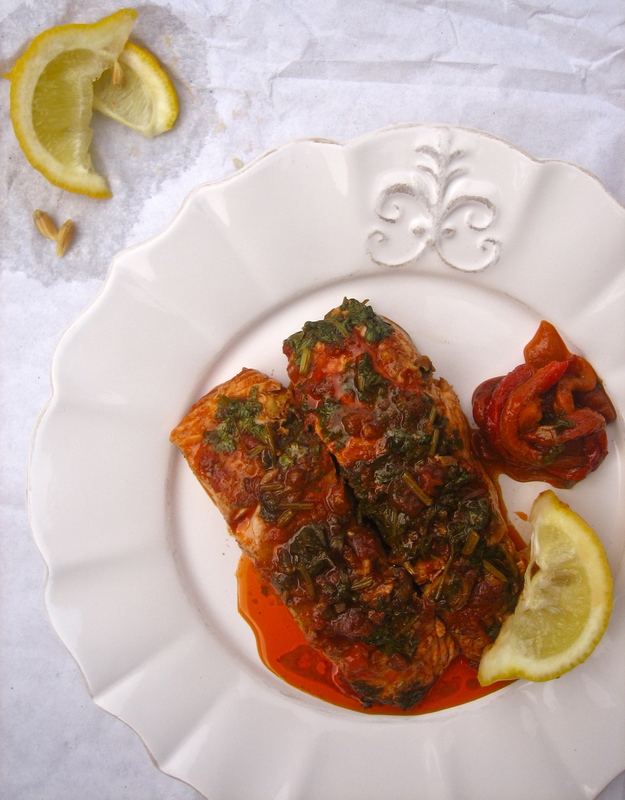 We love salmon, so that’s what I make most often at home. 1. Whisk all of the sauce ingredients together in a bowl or tall glass. 2. Set a large shallow pot (large enough to hold the fillets in a single layer) over medium heat. Pour the sauce into the pot, then gently add the fish fillets. Add the vegetables, and shower with cilantro. Bring to a boil, then cover and simmer on a low flame, for about 20 minutes, turning the fillets once, until the fish flakes easily and is tender and cooked through. You’re so sweet, Debbie! wish you could come over too! although at the moment I don’t have fish, but do have warm oatmeal muffins! soon, soon, soon.